Hybrid Perpetual. ‘Duchess of Sutherland’ has deep pink flowers, highly fragrant and with a red edge, although this is not obvious in the plant in my garden. It was recommended as a pot rose. [Paul (1848, 1863, 1888), Rivers (1854, 1857, 1863), Henry Curtis p.3 vol.1/1850, Gard. Chron. (1847, 1856)]. Introduced by Laffay in 1839. It was beautifully figured in the British Florist. [BF pl.52/1844]. 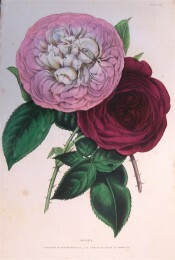 Rosa ‘Duchess of Sutherland’ | BF pl.52/1844 | RBGS. Duchess of Sutherland is the pink rose on the left.